a face-to-face interview with a school representative. The Solvay Admissions Assessment is a comprehensive exam in English covering three different areas that can be difficult for many students who do not prepare for the exam. Since a student can only attempt the test once – being prepared is essential to your success! 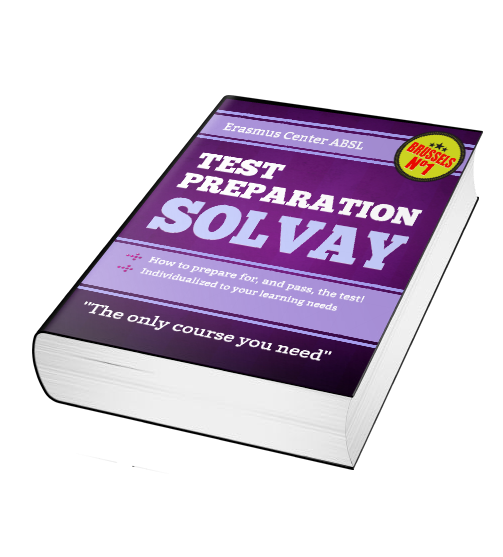 The Erasmus Center teachers are familiar with the testing and admissions process at Solvay and can guide you thru the tutoring needed for all three parts of the exam. Our preparation is individualized to your learning needs. After a fully simulated free diagnostic exam, we will develop your tutoring plan and present the options to you for paid tutoring. Erasmus Center also offers regular FREE Seminars on test preparation and admissions planning. Why is a live tutor better than an online test prep? You’ll get personal feedback. Because the test is about interaction, talking to a live person will give you the advantage you need to master the test. Quantitative Test: This is a multiple choice test which takes 30 minutes to complete. The test score becomes part of the application to the school and the results are not shared with the student. The test is only given once – no opportunities for taking the test again will be given. Essay: Applicants will have 30 minutes to write a one-page essay. Topics will be given to the student at the time of the exam. Interview: The interview is conducted by two alumni. Candidates will be assessed on the basis of prior level and quality of work experience, academic background and a discussion of short term and long term career goals. After testing the results will be reviewed by the Admissions Committee which meets once a month to access the application. Solvay and Solvay Admissions are terms used for, and copyrighted by, the Solvay Brussels School of Economics and Management of ULB, which is not a part of Erasmus Center, ASBL.